Every week we pull together some great Canadian recipes from food bloggers around the web featuring one main ingredient or dish. This week we highlight the lovely, fragrant summer herb, lavender! Lavender may be the quintessential summer herb with its delicate purple flowers and soothing fragrance. It's also quite easy to grow so it's worth trying in your own back yard. It makes for a lovely addition to cocktails, iced tea, cookies, salads, desserts or infusing into sweeteners. Make sure you use the culinary grade lavender when cooking with it and for more information on lavender and how to use it and grow your own, visit our Spice Box Guide to Lavender. **[Lavender Shortbread Cookies](http://www.sugarlovespices.com/lavender-shortbread-cookies/)** from **Sugar Love Spices**. 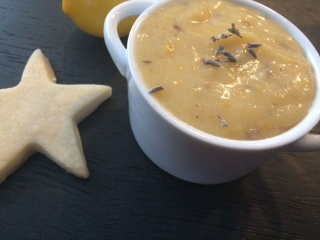 **[Lavender Lemon Curd](http://www.foodmamma.com/2015/12/lavender-lemon-curd.html)** from **Food Mamma**. **[Summer Market Salad](http://kitchenuncorked.com/2015/08/04/summer-market-salad/)** from **Kitchen Uncorked**. **[Lavender Earl Grey Martini](https://leafycauldron.net/2014/08/26/lavender-earl-grey-tea-martini/)** from **The Leafy Cauldron**. **[Lemon Lavender Shortbread](http://avirtualvegan.com/lemon-lavender-shortbread-cookies/)** by **A Virtual Vegan**. **[Lavender Honey Ice Cream](http://myislandbistrokitchen.com/2012/08/09/876/)** from **My Island Bistro Kitchen**. **[Lavender Meringue with Raspberry and Whipped Mascarpone](http://www.cocoabeanthevegetable.com/2015/03/lavender-meringue-with-raspberry-and.html)** from **Cocoa Bean the Vegetable**. **[Lavender Infused Honey](http://www.naturalgirlmodernworld.com/home/infused-honey-three-ways-vanilla-orange-lavender)** from **Natural Girl, Modern World**. **[Lavender Scones](http://thefoodblog.net/lavender-scones/)** from **The Food Blog**. **[Strawberry Shortcake with Lavender Lemon Cream](http://www.mykitchenlove.com/strawberry-shortcake-lavender-lemon-cream/)** from **My Kitchen Love**. [Lavender Infused Sugar](http://satoridesignforliving.com/2014/07/lavender-infused-sugar/) by **Satori Design for Living**. **[Lemon Lavender Coconut Mousse Mini Tarts](http://www.isugarcoatit.com/2016/05/lemon-lavender-coconut-mousse-mini-tarts.html/)** from **I Sugar Coat It**. **[Lavender Rose Mini Cheesecakes](http://www.urbnspice.com/urbnspice-chefs-muse/inspirationofurbnspice/lavender-rose-mini-cheesecakes/#more-4172)** from **Urb'n'Spice**. **[Lavender Crème Brûlée](http://www.sweet-sundays.com/home-main/lavender-crme-brle)** from **Sweet Sundays**. **[Lavender Lady Cocktail](http://clockwatchingtart.blogspot.ca/2016/06/happy-hour-lavender-lady.html)** from **Clockwatching Tart**. A big thank you to all our FBC Members who participated in this weekend's lavender recipe roundup. These all look so lovely and I can almost smell the fragrant lavender from the photos! Thanks for sharing my shortcake!